← 1 Year Anniversary !! 1. How many descendants of the 154th NY Regiment have you contacted thus far and how many letters have you recovered? MD: To date, Iâ€™ve contacted 1,024 descendants of members of the 154th New York, both direct and collateral. Many of the young unmarried soldiers who died in the service left no direct descendants, so they are represented by collateral relatives. At the moment, Iâ€™ve located, copied, and transcribed 1,613 wartime letters and 25 diaries by members of the 154th. Incidentally, the number of descendants could be larger by the time this interview is posted. I hear from â€œnewâ€ descendants frequently, on average about once a week. And the number of letters will soon increase, because a descendant is about to publish a collection of his ancestorâ€™s wartime letters. 2. What percentage of those letters were in private collections? Iâ€™ve never broken it down, but the vast majority of the letters (and diaries) were shared with me by descendants. I have found a considerable amount of material in repositories scattered around the country. For example, I turned up about 100 wartime letters at the National Archives in the pension applications of dependent parents whose sons had died in the service. The bibliography of Brothers One and All, although a few years old, lists the origins of many of my sources. 3. How have you manged to track down so many descendants? What is your process? I made my first serious efforts to track down 154th New York material in the early 1970s, after Mike Winey and I had agreed to collaborate on a regimental history. (Mike had written his masterâ€™s thesis on the 154th at Cooperstown in 1967; I discovered it there on my birthday in 1970, when I happened to be passing through.) In 1973 I made the first of what have become annual trips to western New York to see if the legacy of the 154th survived. I concentrated my efforts in Cattaraugus and Chautauqua counties, where the regiment was raised. I visited the offices of newspapers in Olean, Salamanca, Jamestown, and elsewhere, and they very kindly publicized my quest. Within days after the first article appeared, I heard from Peggy Whitcomb of Great Valley, New York, who told me her family had nineteen letters written by her great-uncle, Harvey Earl of Co. H. The letters ended before Gettysburg, and the family didnâ€™t know of Harveyâ€™s fate. I was able to tell Peggy that Harvey was captured at Gettysburg and died as a prisoner of war at Andersonville, where he is buried in Grave #2443. So the floodgates initially opened as a result of that publicity, repeated in subsequent years. Then word of mouth spread the news and I began to hear from people outside of New York State. When Mike Wineyâ€™s and my book The Hardtack Regiment was published in 1981, more material surfaced. For years I wondered how to make the search for 154th New York descendants and documentation a truly national one, and then the Internet age dawned. My son, Karl, helped me set up my Web site www.hardtackregiment.com and it has become the primary link between descendants and me. Almost all of the descendants I hear from nowadays come to me via the Web. But the old-fashioned methods still work. For the past 22 years, Iâ€™ve organized annual 154th New York descendants reunions in Cattaraugus and Chautauqua counties. We meet in a different town every year, much like our ancestors did as veterans a century ago. Every year the reunion is publicized in area newspapers, and every year some new descendants show up at the event. 4. How did you learn about your great-grandfather, John Langhans, who served in the regiment? How did that spark your interest? My interest in the 154th New York was sparked during childhood by stories my father told me that he had heard from his maternal grandfather, John Langhans, a former corporal of Co. H who had marched with Sherman to the sea. My father grew up with his parents and grandfather on the family farm in Ellicottville, Cattaraugus County, and was sixteen when the old man died. Consequently, he knew his grandfather well and well remembered his stories. They gripped me with a passion that has never loosened. In addition to the stories, our family had preserved much of John Langhansâ€™s material Civil War legacy, including six wartime letters he sent to a younger brother, his silver 20th Corps badge, the buttons from his Grand Army of the Republic coat, the colorful ribbons and badges he wore at reunions, and a box of cotton bolls he picked during the March to the Sea. My interest soon transcended my great-grandfatherâ€™s personal service to encompass that of his regiment as a whole. 5. The 154th saw action in Chancellorsville, Gettysburg, Chattanooga, Knoxville, Atlanta, and others, yet before your incredible research and writing, their story was not widely know. Why do you think that was? You have to wonder how many similar regiments are still forgotten? Thereâ€™s a great irony in my work. In the postwar years, an eccentric Ellicottville lawyer named Edwin D. Northrup appointed himself historian of the 154th and worked for more then twenty years on a book, corresponding with and interviewing veterans of the regiment. But Northrup blew a deal to publish his book and it never appeared. On top of that, his manuscript was lost. Only a tiny fragment of it survives in Northrupâ€™s papers, which are at Cornell University. Fortunately, much of the correspondence and interview notes he took for the book survive, and theyâ€™re a great resource. I tell the Northrup story in detail in Brothers One and All. Iâ€™ve often thought how different my life would be if Northrup had published his history of the 154th. Chances are my family would have had a copy and who knows â€“ I might have looked at it as a kid and been bored stiff. But as it turned out, Mike Winey and I were aware of Northrupâ€™s effort when we wrote The Hardtack Regiment, and his failure was a great impetus to us to make sure our own work was published. Sadly for the veterans of the 154th, our effort came a century too late for them to know that their deeds had been chronicled in print. To answer the second part of your question, when I wrote about Northrupâ€™s failed history in Brothers One and All, I did a survey in Dornbusch. 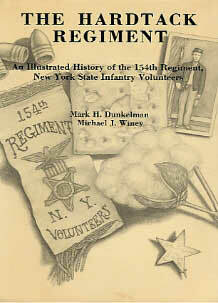 Of approximately 190 New York State infantry regiments, only about 60 of them had regimental histories published. So there are a lot of unchronicled Civil War regiments out there. 6. Your newsletter that goes out to descendants and all interested parties of the 154th, calls them “Hardtack Regiment,” how did you come up with that name? What’s the story behind it? The 154th New York got the Hardtack nickname in the 1862-1863 winter camps. Members of the regiment traded coffee to the other regiments in their brigade for hardtack, which they had a special fondness for. Everything was on the up and up until some of the 154th boys dried their used coffee grounds, rebagged them, and traded them for good hardtack. The other regiments quickly detected the ruse and branded the 154th boys â€œHardtacks.â€ The nickname stuck and the 154th New York became known as the Hardtack Regiment. The men referred to themselves as Hardtacks for the rest of their days. 7. 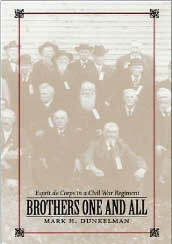 Your book “Brothers One and All” is in my opinion probably the most impressive regiment history (study) that I have ever read, yet it is much more than that. How did you come up with your thesis to study the “Espirit de Corps” of a Civil War regiment? Thank you for your kind comments about the book. Iâ€™m gratified that you and so many other readers found value in it. To answer your question, I consider the 154th New York the lens through which I study Civil War history. Consequently Iâ€™m interested in a lot of topics that relate to the regimentâ€™s experiences. So Iâ€™ve long been interested in studies of the warâ€™s common soldiers. Many historians, I noted, commented on the soldiersâ€™ devotion to their regiments, but few analyzed that devotion â€“ that esprit de corps â€“ to any significant degree. By 2000 I had collected enough primary source material on the 154th to use it as an example in a study of Civil War regimental esprit de corps. I posed and attempted to answer several questions about esprit â€“ how and why it developed, how it manifested itself, obstacles it had to overcome, and how it carried over into the postwar years in the form of veteransâ€™ commemorative activities. The latter aspect was important to me. In my opinion, not enough work has been done on Civil War veterans. To me, a soldierâ€™s later life is closely linked to his wartime service, just as the antebellum period and Reconstruction are inseparable from the war itself. 8. I read that you conducted research for over a decade (which is simply incredible), obviously you were very motived. How difficult was it to pull yourself away from your work once raptured by it? Actually, Iâ€™ve been doing this work since I was a kid, so itâ€™s been more than four decades. Since my childhood Iâ€™ve had two other passions besides Civil War history â€“ making art and music. I went to art school â€“ I never took a college history course â€“ but my last serious artwork was the 80-foot-long mural behind the 154th New Yorkâ€™s monument at Coster Avenue in Gettysburg, which I researched and designed over a period of years. I painted the mural with artist Johan Bjurman and it was dedicated in 1988, the 125th anniversary of the battle. Around that time I decided that my study of the 154th New York could yield some work of value and I began devoting more and more time to Civil War research and writing. Iâ€™ve been playing music all along (pedal steel guitar and dobro) and I hope to devote more time to that in the future. In the meantime, my Civil War work keeps me busy full time. I spend a lot of time corresponding with descendants, conducting research, and writing. Itâ€™s become my lifeâ€™s work. 9. What is it that makes the 154th unique? Every Civil War regiment had a unique story, and each regiment contained hundreds of individual stories. But I donâ€™t think the 154th New York was unique in the true sense of the word. It was somewhat unusual in certain respects â€“ it had a higher percentage of farmers in its ranks than normal, for example, and it fought in both theaters of the war â€“ but even those factors donâ€™t set it apart as unique. Iâ€™ve often described it as a typical Union regiment, but thatâ€™s at best another vague generalization. 10. Can you share a story or event from your research of the 154th that you probably will never forget as I understand you travel a lot? Iâ€™ve had many magical moments in the years Iâ€™ve been doing this. One example occurred in the early 1970s, during my research for The Hardtack Regiment. I had the good fortune to meet Kittie Rehler of Allegany, Cattaraugus County, who was more than 90 years old and the daughter of Pvt. Ashbel L. Bozard of Co. C. (Kittie was one of several children of veterans of the 154th who I contacted early on in my research; they are all gone now.) Kittie had a couple of wartime tintypes of her father that she permitted me to copy. As I was about to leave her house after a pleasant visit, Kittie told me to wait â€“ she had something else to show me. She climbed the stairs to her attic and came down carrying a framed photograph of sixteen veterans of the 154th New York at their monument in Gettysburg. It was the first such photograph I had ever seen. Kittie pointed to one of the men and said, â€œThatâ€™s my father.â€ I pointed to the veteran standing next to him and said, â€œThatâ€™s my great-grandfather!â€ I recognized John Langhans from his other late-in-life portraits. That was an unforgettable moment. Incidentally, after Kittie died, her daughter presented the photo to me. Of course I treasure it. 11. Do you have a single favorite soldier you researched? Iâ€™ve gotten to know certain soldiers better than others because of the amount of source material available, but it would be hard for me to single one out as my favorite. In my second book, Gettysburgâ€™s Unknown Soldier: The Life, Death, and Celebrity of Amos Humiston, I was pleased to tell Amosâ€™s story in greater detail than ever before, and especially to use his wartime letters, which I discovered in the possession of a descendant. In the many other tellings of the Humiston story, Amos was always a corpse on the battlefield; I was able to breathe some life into him. My most recent book, Warâ€™s Relentless Hand, relates human interest stories of a dozen members of the regiment. One of them, Pvt. Barzilla Merrill of Co. K, was killed together with his teenaged son, Alva, at the Battle of Chancellorsville. Barzillaâ€™s personality, as revealed in his letters, has always appealed to me. I would describe him as richly and warmly human, thoughtful and expressive, and a thoroughly good man. 12. For me the motivations of Civil War soldiers is a fascinating aspect of social history. Finding the epic nature of average men taking part in epic times reveals such humanity and humility, as I think you have noted. What can we learn from the writing of the men of the 154th? Any comparisons with the present? I think we can learn much from the writings of Civil War soldiers, whether they are members of the 154th New York or any other unit. Although they used different terminology, Civil War soldiers sent many of the same messages sent by soldiers of different eras and soldiers of today. In general, their wishes were humble: To do their duty to the best of their abilities, to help their cause emerge triumphant, and to survive the ordeal of war and return home to their loved ones. 13. What are you writing or working on now? Iâ€™m writing a book tentatively titled Marching with Sherman: Through Georgia and the Carolinas with the 154th New York. Itâ€™s the fifth of what I conceive as a quintet of books on the 154th. It also returns me to the early inspiration for my work â€“ the tales of my great-grandfather on the March to the Sea. Iâ€™ve got plenty of material to tell the 154thâ€™s side of the story. My goal is to include the stories of the Southerners the regiment encountered along its route through the three states, and to compare and analyze the two perspectives. This past January and February I spent six weeks following the route and collecting documentary material and family stories. I came away with enough sources to meet my goal, and Iâ€™m currently weaving them into my manuscript. Iâ€™m really excited about this book, as I am about all my Civil War history work. For more information on the Hardtack Regiment or to order one of Mark Dunkelman’s books: www.hardtackregiment.com. I work on my family genealogy when I can and I was recently given a copy of a letter that was written about my ancestor’s life after he died. The letter describes Charles H. Foster fighting on both sides. He fought for the Confederate in Virginia when he was in Kanawha County in Virgina with his wife’s family. They took care of General Henry Wise and some of his men in 1861. He and his wife left after Christmas 1861 and returned to Pittston, Pa. Then later in the letter he is described as responding to emergency calls for men to defend the Union. One was with the Antietam Campaign and the other is the Gettysburg Campaign. He was enrolled in 1863 as a sergeant. Did he really fight on both sides? Did others do that too? Did the Confederate and Union armies have a way to tell if someone had already fought on either side? From Civil War nurses I often read the closing of a letter as Yours in F., C., and L. Do you know what the letters stand for?